The TDR2050 is the first instrument in this class to incorporate a built-in 600 V input protection filter suitable for CAT IV 600 V applications. Furthermore, the new TDR2050 features an enhanced and highly intuitive user interface. In addition, a tagging facility that allows users to add a name - such as circuit ID or building name - to saved traces has also been included for convenience. As a further aid for users, the TDR2050 also features an AutoFind function to take them quickly to the fault while an automatic FindEnd function that provides a convenient way of making fast cable length measurements. The dead zone effect of a standard pulse TDR can mask near-end faults and make them undetectable but the inclusion of a step function on the TDR2050 eliminates this problem. With step TDR technology the signal is injected at full strength and stays there until a disturbance is detected, making the TDR2050 suitable for detecting near end faults that standard pulse TDRs can miss. Also featured is a distance-dependent gain function. This eliminates the drop-off of signal due to attenuation on longer lines by gradually increasing the gain applied to the return signal. As a result, this function allows a more even representation of the relative attenuation at all points along the trace. Like other instruments in the TDR2000 range, Megger’s new addition has a minimum resolution of 0.1 m combined with maximum range of up to 20 km, depending on the velocity factor selected and the cable type. The new TDR is supplied complete with Megger TraceXpert software, which gives users full control over downloading, reporting and uploading of saved trace results. 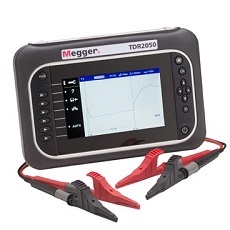 Like all Megger equipment, the TDR range has been designed with user safety in mind. 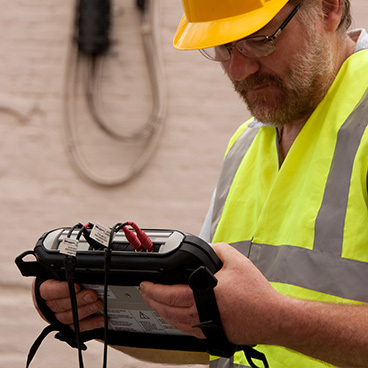 The instruments comply with IEC61010-1, EN60950-1, EN61010-3, UN38.3 and EN62133 safety standards.